Are you looking down as you read this? Are your shoulders scrunched up toward your ears? Is your back rounded with your chin tucked down? Our fast-paced, high tech world invites poor posture. We look down at our cell phones. We hunch over to work on our lap tops. We hold the phone between our shoulders and our ears. We carry heavy bags slung on our shoulders. And when we finally relax at the end of the day, we slump into our comfy chairs. This leads to headaches, neck pain, shoulder pain, back pain, nerve compression and muscle imbalances that leave us at greater risk of injury. 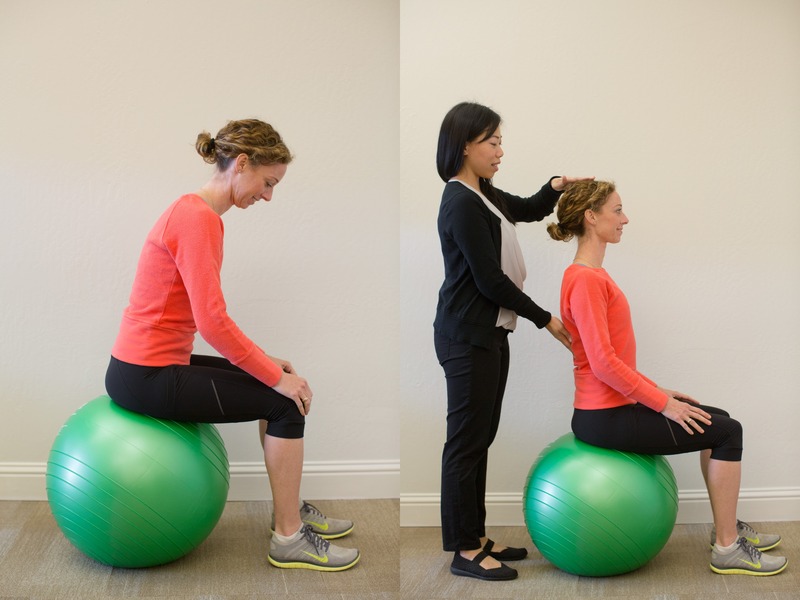 “Sometimes people feel the results of bad posture, but often, they don’t realize that they’ve been doing damage to themselves until something happens and they get hurt,” said Jane Lee Quach, Ella Health physical therapist. What does good posture look like? Your back is straight, your shoulders are down and chin is up. To see what it feels like, stand up and bend over then slowly roll up and envision that you are stacking one vertebrae on top of the other until you are fully upright. You can also envision that an invisible string is pulling you from the top of your head. Fortunately, there are some simple things you can do to improve your posture at any stage of life. Much of it is being aware of what you’re doing, making corrections throughout the day and changing habits. When sitting: Adjust the chair so your knees bend at a 90 degree angle and you can keep both feet on the floor. Sit up with your shoulders relaxed and your chin up. If you are using an ergonomic chair, make sure the arm rests are adjusted to the right height to support a 90 degree bend at your elbows. On the cell phone: Hold the cell phone in front of your face so you are looking straight at it rather than bending at your neck to look down at it. If that’s not possible, hold your head straight and look down at the phone with your eyes. On your laptop: Put your computer on a surface that allows you to type with your arms bent 90 degrees at the elbow. Keep your head straight and look down with your eyes rather than hunching over to see the screen. Try using a separate key board and set your computer higher so you can look at it without bending at the neck. When traveling: Adjust the neck rest of your seat so that it is at the neck rather than the back of your head, pushing your head forward out of alignment with your spine. When carrying a bag: If possible, use a backpack that distributes the weight of a heavy load evenly. If you use a bag with a strap, switch sides. When sleeping: The best position is on your back with a pillow under your knees. If you sleep on your side, place a pillow under your head so your head is in alignment with your spine and place a pillow between your knees. Avoid sleeping on your stomach. Set a timer to go off once an hour to check your posture. Put a sticker on your laptop or desk as a visual reminder. Pair up with a buddy who can check in to see how you are doing.